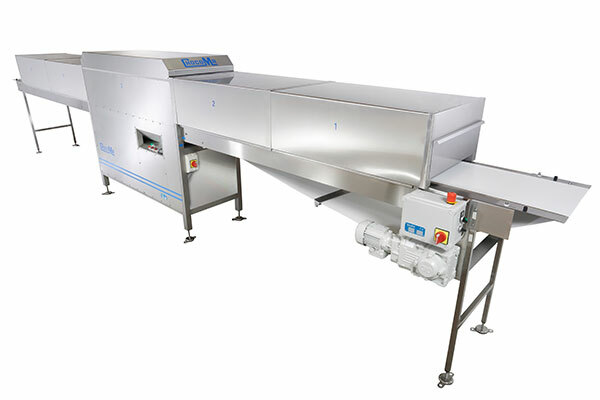 The Chocoma C+CS cooling tunnels are designed to cool chocolate products received from moulding equipment or enrobers with a width up to 600 mm – for instance from the Chocoma enrober range 2MP. The shortest standard model is 6,6 meter long. The total length can be increased in sections of 2,0 meter. 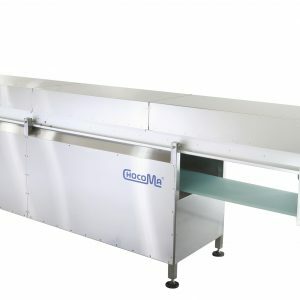 The first meter of the cooling tunnel is an open decorating table for decoration of the products. The last meter in the rear end is an open packing table. Before entering the packing table the products are released from the main belt, which enables a gentle removal of the cooled products. The cooling tunnel is designed as a ”plug & play” unit; that is, once the cooling tunnel is set up and assembled, and receives electrical power, then it is ready for operation. The control and cooling systems are “stand alone” systems that are completely factory made – fully tested and approved for immediate operation. No local external technicians are needed in this context. Chocoma cooling tunnel type C+CS is originally designed to be used together with the Chocoma enrober models 2MP24, 2MP32, 2MP40 and 2MP60. 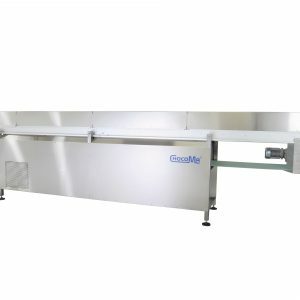 However, it can also be used together with other cooling tunnel brands with a maximum belt width of 600 mm. By means of a cooling compressor, cooling is generated in the cooling section placed in the middle of the cooling tunnel. Cooling of the products is based on an air re-circulating concept, where cold air continuously is circulated from the middle of the cooling tunnel to both ends of the tunnel. Thanks to this air circulation concept, the loss of cold air and necessary energy consumption is minimized. The conveyor table is covered by insulated top sections of 1 meter. They are made as a light weight construction easy to handle without use of tools. The top covers have a 50 mm insulation. The conveyor belt is controlled by an automatic belt steering device. Belt speed Standard belt speed is variable between 0,0 – 3,0 m/min. Insulation Conveyor table 25 mm. Top covers 50 mm.